November has arrived! 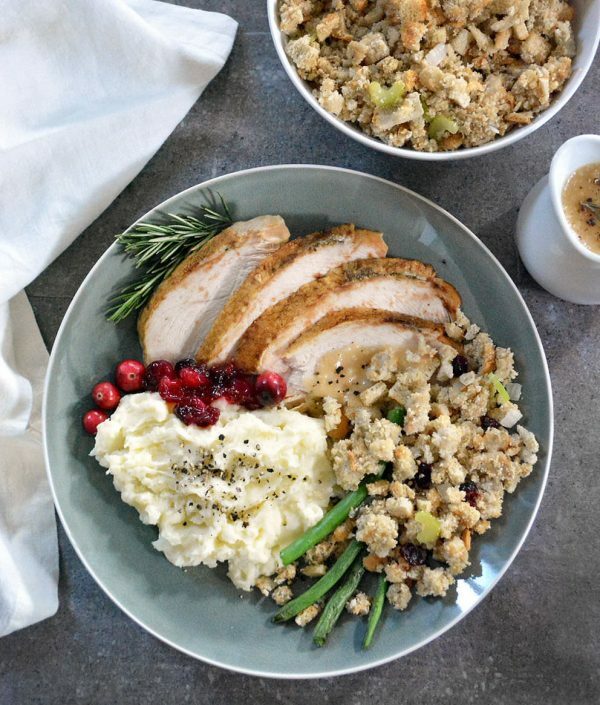 Which means all things Thanksgiving including this easy Instant Pot Turkey recipe. Why make your turkey in the Instant Pot? Cooking a whole turkey in the Instant Pot takes just 60 minutes (including the build up time) leaving more time for grubbing, chatting or football cheering! Our holidays are traditionally large so we serve two types of meat for the crowd. Cooking the turkey in the Instant Pot leaves our oven open for our Garlic Herb Prime Rib Roast. This Prime Rib Recipe has 1,000’s of 5-star reviews so make sure to check it out if you’re making one this holiday season. My dream kitchen has two ovens, however my real kitchen has one. As such my holiday menus are designed around what I can bake with just one oven. Our beloved popovers are best fresh, but they take 30 minutes to cook so they’re often either cold or left off the menu. Enter this Instant Pot Turkey and popovers are back on the menu (recipe to come – stay tuned!). Prefer a crispy skin? I get it. I love crispy skin also. To achieve this on an Instant Pot turkey, merely preheat the oven to broil as you’re letting the turkey NPR. Transfer the cooked turkey to a large sheet pan, baste the skin with some drippings and broil for 5 minutes. Crispy skin, achieved! Let’s chat for a second about the color of poultry coming out of the Instant Pot. It doesn’t end up golden brown like when roasting. The skin is pale and colorless and matches the juicy meat. A solution? Use kitchen bouquet to add the dark brown color to the skin mimicking the “roasted” coloring. Just use a small pastry brush and brush away after it’s finished in the IP. This is how all the turkey’s used in commercials and print look so appetizing. Now you know. Does the Instant Pot Turkey need to brine? You decide. We skipped brining, for testing purposes, and the turkey was juicy and flavorful. 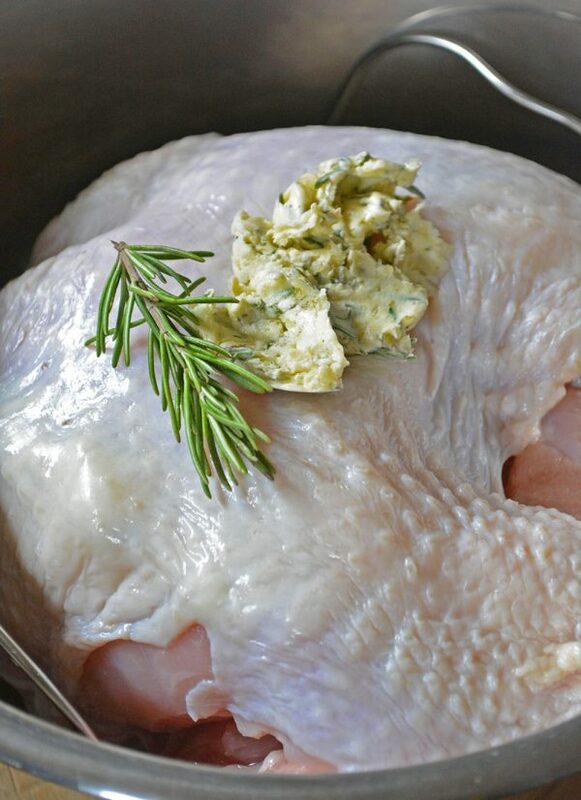 BUT – brining does add an extra layer of flavor and moisture, so if brining is your thing brine away! Calculate 6 minutes per pound. Our turkey was 6 pounds, so we set the high pressure timer to 36 minutes. It was exactly 165 degrees after NPR. Exactly. Using a digital meat thermometer is A MUST! Nobody wants to be sick on Turkey Day thanks to undercooked poultry. Yes. Just stick it in a freezer Ziploc bag and freeze up to 6 months. The best part about Instant Pot Turkey is the left over drippings to use for the gravy or future recipes. I had about 3 cups of this liquid gold. Plenty to make a large batch of gravy to smother the bird and potatoes with. 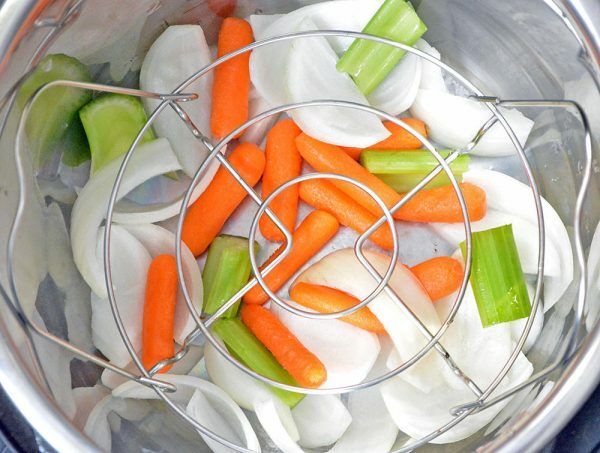 To make the gravy, remove all the left over veggies with a slotted spoon. Measure 2 cups of the drippings and reserve the rest for another recipe. Turn the Instant Pot on to the saute setting. 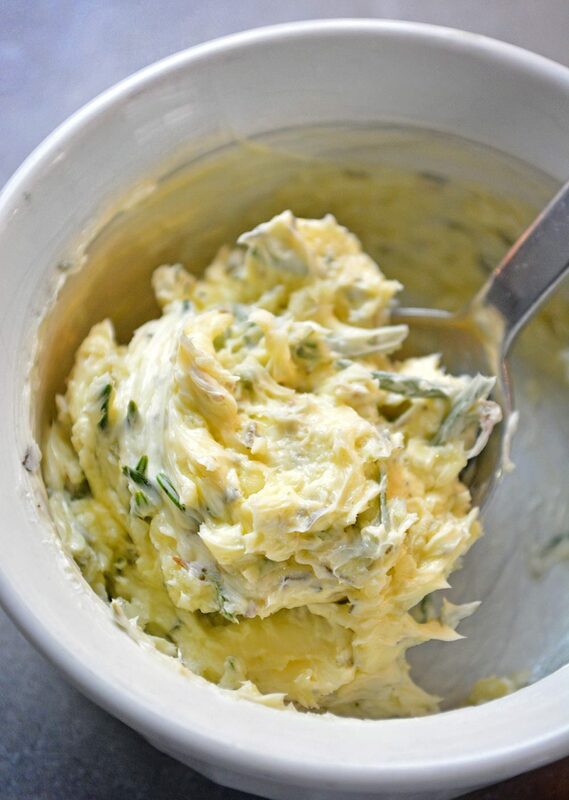 In a small bowl, whisk 2 tablespoons of cornstarch (or 4 tablespoons of flour) with 1/4 cup of cold water. Slowly add this to the drippings and whisk well. Continue to whisk and saute until the gravy cooks down to your desired thickness. Salt and pepper to your liking. You can easily add fresh or dried herbs to flavor the gravy as well (think thyme, rosemary, sage). WHAT SIZE TURKEY CAN I MAKE IN THE INSTANT POT? For this recipe, we used the popular Instant Pot Duo Plus, which has a 6 qt capacity. You can fit a bird up to 7 lbs. in this pot (as long as it’s a traditional shape). You’ll have to adjust accordingly if you have a smaller or larger pot. 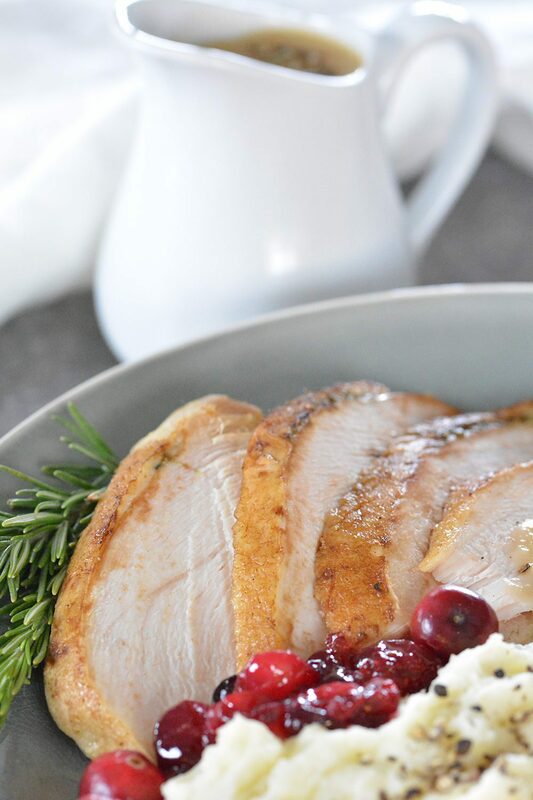 Free your oven and up "family time" by making this Easy Instant Pot Turkey Recipe for your next holiday meal. 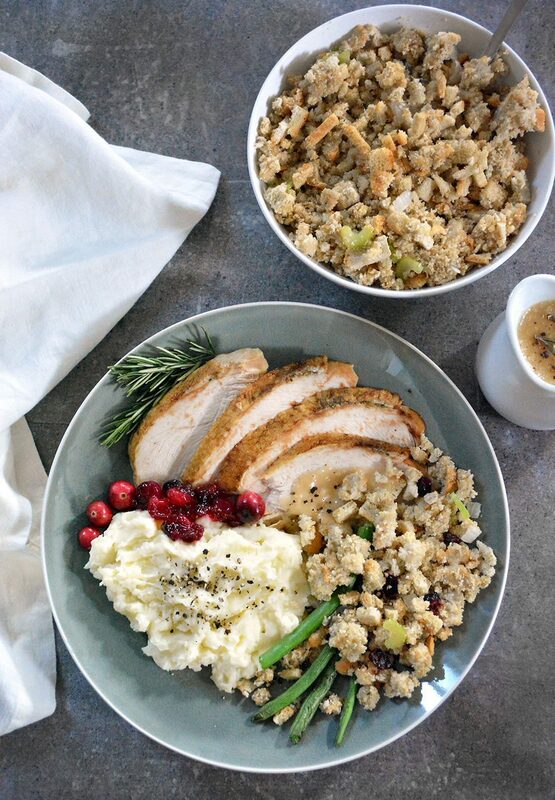 You'll end up with a juicy and flavorful turkey in half the time. 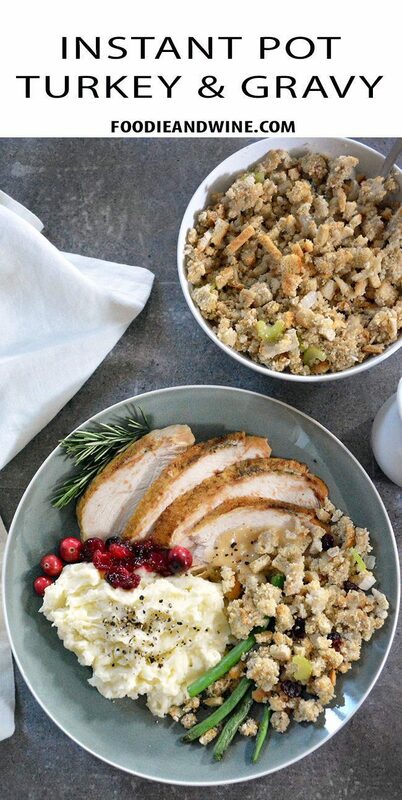 Using two large forks, carefully remove the turkey from the instant pot to a large cutting board or large cooking sheet if you are crisping the skin. If you're using kitchen bouquet, brush it on before putting in the broiler. Cook Time - Remember to calculate 6 minutes per pound to get the bird to the required 165 degrees. Is this for a turkey breast or a while turkey? Thank you! This is for a whole turkey.